Credit, U.S. House of Representatives. Montana’s Ryan Zinke is now the Secretary of the Interior, having been confirmed by the Senate last week. 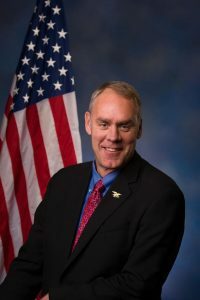 Zinke has been supported by the American Fly Fishing Trade Association, as well as the Outdoor Industry Association, and many other outdoor sports-associated organizations. Zinke famously rode a horse to his new office on his first day on the job, and in his first photo op. (behind a carefully positioned image of Theodore Roosevelt) he signed two secretarial orders—the first to expand access on public lands, the second to overturn a ban on lead ammunition and fishing tackle on federal lands and waters. The access issue is a win. The lead issue is a win for lead tackle manufacturers, though the jury is still out for some of us on whether further allowing a proven toxin to be put in the water actually expands “opportunity.” But the American Sportfishing Association has been lobbying for that, and a number of conservation organizations, including Ducks Unlimited and TRCP, were there to show support of Zinke and his orders. I wrote a piece on lead for Field & Stream magazine several years ago (photographs by Brian O’Keefe) called “What Lies Beneath.” Please check it out on page 80 of that back issue. Many in the fly fishing industry have traditionally been in favor of replacing lead and it’s probably time we reassess where we stand on that issue.